The City of Hoboken is recognized as a Bronze Bicycle Friendly Community by the League of American Cyclists, making Hoboken the only municipality in New Jersey with the distinction of being recognized as both bike-friendly and walk-friendly. Bicycling is green, it’s stress-free, and with more and more bike lanes and bike racks going in every month, there’s no better time to start riding. For decades, streets seem to have been dedicated exclusively to cars, but Hoboken is making a concerted effort to better rationalize this valuable public space. 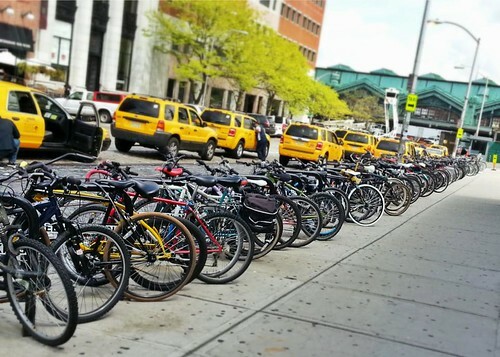 The more people riding bikes in Hoboken, the more drivers will become familiar with them, so your choice to ride helps contribute to the balancing of the public use of our streets. But more importantly, bicycling is by far an easier way to get around Hoboken than driving. Give it a try! This map illustrates the locations and capacities of existing and planned bicycle racks as well as bike lanes within the City of Hoboken. All planned locations are not final and therefore are subject to change. The City of Hoboken has been constantly expanding bicycle parking facilities. Since 2009, bicycle parking capacity has increased by more than 50% and now exceeds 1,000. Bike parking near the PATH has more than doubled during that time. During 2010 Bike-to-Work Week, Mayor Dawn Zimmer instituted an indoor bike parking policy at City Hall for employees of the City of Hoboken. Businesses are challenged to institute similar policies for employees. In December, 2011, the City of Hoboken installed its first self-service bike repair station, becoming one of the first municipalities on the east coast with a public bike repair facility. The bike repair service station behind the Bus Terminal adjacent to the PATH has a stand to hold a bike, a hand-operated air pump, and basic tools including wrenches, screw drivers, and tire lever for minor repairs. The city has created a trust fund for the collection of donations intended to increase bicycle facilities throughout the city. Residents and businesses can sponsor bike racks, bike repair stations, and on-street bike corrals to be installed outside their storefronts or other locations with an inscription acknowledging the sponsor. Click here to download the Bicycle Rack/Bike Repair Station Sponsorship Form. Click here to download the Bicycle Corral Program and Application Form. Bicycle lanes are like training wheels: they are both an invitation to bicyclists to use their public space and an indication to drivers that they should expect to see bikes along the street. In 2009, Hoboken began to expand it’s bicycle lane network by designating and striping streets as Class II (5 foot wide striped lanes) and Class III “sharrows” (sharing arrows) bike lanes. Sharrows are used on streets that are too narrow to accomodate a striped bike lane and they communicate to drivers and bicyclists that a street is meant to be shared by both groups. As bicycling increases in Hoboken, drivers will continue to become more familiar with bikes sharing the streets, and these markings act as a way to remind drivers to expect to see bicyclists. In 2011, Hoboken passed an ordinance designating an additional 10 miles of streets with striped Class II bike lanes. Striping for these lanes began in Spring, 2012. Class II bike lanes on one-way streets with parking on both sides are typically located on the left side of the street because when an exclusive lane is designated for bicycles on one-way streets, studies from other cities have shown that bicyclists are 66% less likely to be hit by a parked car’s door opening if that lane is on the passenger side of the car, rather than the driver’s side. Placing the lane on the left also minimizes conflicts with buses and shuttles that pick up and drop off passengers on the right hand side of the street. In addition, a Class I fully-separated off-street bike lane exists parallel to Sinatra Drive between Newark Street and 4th Street. Ride in the direction of traffic, not against it. Stop for pedestrians at crosswalks. Stop at stop signs and red lights. Yield to pedestrians and ride no faster than pedestrian walking speed while riding on sidewalks. Use safety and visibility equipment: front white light, red rear reflector, and bell. Wear a helmet if under 17 years old. A. Obedience to traffic control devices. (1) Any person operating a bicycle shall obey the instructions of official traffic control signs, and other control devices applicable to vehicles, unless otherwise directed by a police officer. (2) Whenever authorized signs are erected indicating that a turning movement is restricted no person operating a bicycle shall disobey the direction of any such sign, except where that person dismounts from the bicycle to make the turn, in which event such person shall then obey the regulations applicable to pedestrians. (3) No person shall ride or operate a bicycle in any direction except that permitted of vehicular traffic traveling on the same side of the roadway. (4) Any person operating a bicycle shall stop for pedestrians in crosswalks. B. Riding on roadways and bicycle paths generally. (1) Every person operating a bicycle upon a roadway shall ride as near to the right hand side of the roadway as practicable, exercising due care when passing a standing vehicle or a vehicle proceeding in the same direction, unless an exclusive bicycle lane is provided. (a) Whenever overtaking or passing another bicycle, vehicle or pedestrian within the lane or about to enter the lane if such overtaking and passing cannot be done safely within the lane. (b) When preparing for a turn at an intersection or into a private road or driveway. (c) When reasonably necessary to leave the bicycle lane to avoid debris or other hazardous conditions. C. Manner of riding bicycle. (1) A person propelling a bicycle shall not ride other than astride a permanent and regular seat attached thereto. (2) No bicycle shall be used to carry more persons at one time than the number for which it is designed and equipped. D. Speed restrictions. No person shall operate a bicycle at a speed greater than is reasonable and prudent under the condition then existing. E. Yielding right-of-way from bicycle path or sidewalks. Every person riding a bicycle on a bike path or sidewalk that is about to enter or cross a roadway shall yield the right-of-way to all traffic on such roadway. F. Leaving bicycle lanes. No person operating a bicycle shall leave a bicycle lane until the movement can be made with reasonable safety and then only after giving an appropriate signal. G. Motor vehicles in bicycle lanes. Whenever a bicycle lane has been established on a roadway any person operating a motor vehicle on such a roadway shall not drive or park in the bicycle lane except for the purposes of performing a parking maneuver where parking is permitted, to enter or leave the roadway, or to maneuver around a parked vehicle impeding traffic flow. H. Bicycles emerging from alleys or driveways; yielding right-of-way. The operator of a bicycle emerging from an alley, driveway, or building, shall, upon approaching a sidewalk area extending across any alleyway or driveway, yield the right-of-way to all pedestrians approaching on the sidewalk or sidewalk area. Upon entering the roadway the operator shall yield the right-of-way to all vehicles approaching on the roadway. I. Clinging to vehicles prohibited. No person riding upon any bicycle shall attach the same or himself to any streetcar or vehicle upon a roadway. (1) No person shall ride a bicycle upon a sidewalk at a speed greater than the walking speed of pedestrians. (2) Persons riding a bicycle upon a sidewalk shall yield the right-of-way to any pedestrian and shall give an audible signal before overtaking and passing any pedestrian. (3) Persons riding a bicycle upon a sidewalk shall keep as close to the curb as is practicable to allow pedestrians to walk along sidewalks without impedance. K. Carrying articles. No person operating a bicycle shall carry any package, bundle, or article which prevents the rider from keeping at least one hand upon the handlebars. L. Parking. No person shall park a bicycle upon a street other than upon the roadway against the curb or upon the sidewalk in a rack to support the bicycle, or against a building or at the curb in such manner as to afford the least obstruction to pedestrian traffic. M. Lamps and equipment on bicycles. (1) Bicycles in use at nighttime shall be equipped with a lamp on the front which shall emit a white light visible from a distance of at least 500 feet to the front and with a red reflector on the rear of a type which shall be visible from 50 feet to 300 feet to the rear. A lamp emitting a red light visible from a distance of 500 feet to the rear may be used in addition to the red reflector. (2) A bicycle shall not be equipped with, nor shall any person use, any siren or whistle upon a bicycle. (3) Bicycles shall be equipped with a brake which will enable the operator to make the braked wheel skid on dry, level, clean pavement. (4) Bicycles may be equipped with a bell to serve as audible signal for the purposes of overtaking and passing any pedestrian or other bicycles. In addition to bicycle riders, individuals using roller blades, motorized wheelchairs with an orange safety flag at least five (5) feet above street level, and bicyclers with attached trailers for children will also have the same orange safety flag attached to the rear of the portage vehicle, shall also be permitted to use the bike lanes. Ride predictably, act like a good driver. Drivers are used to the patterns of other drivers. Ride in a straight line, obey traffic signs and signals, and do not weave in and out of traffic. Riding predictably reduces your chances of a crash with a motor vehicle. Look, signal and look again before changing lanes or making a turn. Establish eye contact with drivers. Seeing a driver is often not enough. Make sure drivers see you before executing a turn or riding in front of a turning car. Watch out for opening car doors. Be prepared for the possibility that a car door may be opened in your path. When possible, leave room between yourself and parked cars (3 feet is generally recommended) so that you can avoid a door that opens unexpectedly. Stay visible. Wear brightly colored clothing for daytime riding. At night, use reflective materials and lights. Use Your bell. Your bell alerts drivers, pedestrians and other cyclists to your presence, it is required by law. Wear a helmet. They are required by law for cyclists under 17 years of age and are a good idea for cyclists of all ages. Can I ride my bike on the sidewalk? In Hoboken, you may ride your bike on the sidewalk, but you must ride slowly — no faster than pedestrian walking speed — and you must always yield to pedestrians. Keep in mind that sidewalks are primarily intended for walking, and unsafe riding on sidewalks can lead to crashes. Should bikes ride with or against traffic? You must ride in the same direction as cars. A bicyclist has the same rights and duties as motorists, including stopping at red lights and stop signs. Where should I ride if there is no shoulder or bike lane and the travel lane is too narrow to share? Many streets in Hoboken, especially many of the numbered streets, are very narrow and may not provide enough space for a motor vehicle to safely pass a bicycle. On these narrower lanes, a bicyclist might actually “take the lane”, i.e., position themselves at or near the center of the lane. In this way, motorists will see you and not be invited to unsafely squeeze by in the same lane. Bicycle Deliveries are Best: More and more businesses with delivery services are relying on bicycles to get to customers on-time and without the hassle and cost of looking for parking or getting parking tickets. Many local businesses have set the trend by using a wide variety of bicycles and making the system work for their staff, and bicycle delivery sends a green message to customers. If you’re tired of running ahead of parking enforcement, switch to bicycling and save time & money. The City of Hoboken is a strong proponent of this alternative! And if you think bicycle delivery is not practical for your business, consider that almost every restaurant and many other businesses in New York City deliver by bicycle every day in all seasons and weather!